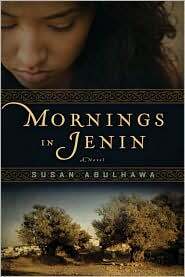 Shocking and powerful: Mornings in Jenin by Susan Abulhawa is a history of heartache that will turn on the water-works. It is an intimate portrait of true loves' deep scars and generations of families that get brought together and pulled apart so many times, that it's like ripping a band-aid off the same place again and again. Each page resonates with such unbearable sadness, that even the most stoic will be moved. This brutally somber story revolves around Amal, who is born into a Palestinian refugee camp called Jenin and knows only about the family's proud olive groves from the stories passed down. Life in a camp surrounded by armed enemies is basically a prison yard, but Amal tries to stay positive. Her Arabic past is like a patchwork quilt that she keeps adding pieces to, in order to keep her heart warm and her mind sane. It is not as easy for her Bedouin mother, Dahlia, who slowly gets her spirit crushed by being forced off her homeland, having her baby boy stolen by an Israeli soldier, and losing her beloved husband. What Amal does have, before the wars start up again, are beautiful mornings spent with her father reading books and reciting poetry. He reminds her that knowledge is something the enemy can never strip you of. This compels her to dive into reading and studies, even after losing her father, getting shot by guards, and watching her mother waste away. The story then follows the life of Amal, and her two brothers Yousef and David, the baby boy named Ismael, who was stolen and raised as a Jew. For awhile, Amal is in denial of everything she has experienced, but as her own daughter grows older and starts asking questions, Amal agrees to return to the city of her birth and confront her past. This novel is so horrible, that it is beautiful. Abulhawa's storytelling traps you in the lives of the characters and no matter how gruesome or tragic, you won't be able to tear your eyes from the page. Mornings in Jenin is a tangible history lesson and it expresses injustices that should not be ignored. Abulhawa's book has gone through several releases (and translations) and, overall, it is a strong piece of literature. The ending doesn't seem to fit with the rest of the novel; it feels new and rambles on longer than it should. Some may find the last section a closure, but a much stronger ending would have been the final moments of Amal's story. The blatant website promoting in this section also cheapens the story, which up until this point is incredibly captivating. It is a shame the book ends like this, because it takes away my urge to recommend it. . . but I still will. Thank you VERY MUCH for reading Mornings in Jenin and for blogging your review. This is my first novel; so, I?m a bit new to the world of writing and publishing. I have to say that thus far, the most satisfying outcome has been the ability to see and read how the characters I?ve come to love as if real individuals, are touching so many hearts around the world. PS. It?s interesting that you mention the website. It actually was not meant to be a promotion of any sort. In fact, I had to scramble long after the fact to buy the domain name and direct it to the book site [which was just created incidentally]. But I agree with you, it?s out of place and in hindsight, I probably could have talked about the website without necessarily mentioning it. It has created issues in foreign translations also, where the website address has been translated. yikes!